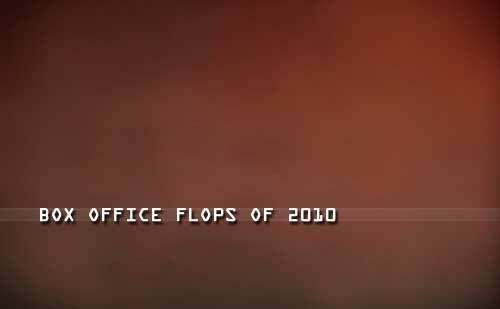 Movies, movies, movies... what would the world be without those box office flops, bombs, or duds? Actually, most of the year (up until fall) there really weren't too many movies that flopped; there were a lot of disappointments (Prince of Persia, The Sorcerer's Apprentice, A-Team, and so on...) Then Fall and the Holiday season came around, and boom! Movies, everywhere failing at the box office, hard. Take into account that movie studios make a little more than half the box office receipts as the other portion goes to the movie theaters and exhibition. I am assuming that usually a movie studio would want to at least make it's budget back in the United States alone, because usually overseas grosses usually doubles that take. This is why movie like Prince of Persia (US Gross: $90 million, Foreign Gross: $244 million, Budget: $200 million), The Sorcerer's Apprentice (US Gross: $63 million, Foreign Gross: $152 million, Budget: $150 million), and The A-Team (US Gross:$77 million, Foreign Gross: $99 million, Budget $110 million) are considered disappointments... because even though they did poorly in the US, they made a nice chunk of change overseas. Although, come to think of it, those movies probably didn't really see a profit considering movie studios would want to make at least double of their budget. Anyways, by that note, Disney's Tangled can be considered a disappointment even though it is doing decently well at the box office (it reportedly costs $260 million to make (although, I'm a bit skeptical as to how a new animated film can cost that much) US Gross: $147 million so far, Foreign Gross: $118 million so far). But we'll see how much this will do when it opens in more theaters overseas, and finally when it hits the DVD and Blu-ray market as well as merchandising, where a movie like this does extremely well. *I had to take off Gulliver's Travels from this because although it is flopping in the States, it's starting to recoup a little bit of its $112 million budget overseas. I hate to put this movie on here because I thought it was a great film... but even great films flop. Jude Law in a movie a could care less to see. Seems like it should have made more than it did... but it didn't. Was Billed to be the next Bourne Identity as it starred Matt Damon and director of two of the Bourne series Paul Greengrass. It even looks like Bourne, but instead Matt Damon's a US soldier... Surefire win right? Wrong. How can a movie with Harrison Ford flop? Well, this is one that did. Trailer looks like a TV movie series of the week. Megan Fox was going to finally break away from the Transformers franchise... and that didn't happen, and so leaving, quitting or getting fired from the Michael Bay franchise may not have been the best career move. Ninjas, Cowboys, and Kate Bosworth... makes for a very interestingly weird movie. An Asian cinema cult film with western actors. An independent arty, edgy pic by Gaspar Noé. Not exactly box office profit material... didn't even pass a million bucks yet... ouch! Still in limited release, one wonders if it will ever reach a wide release... maybe only then, it will be taken off this list. Poor Julie Taymor, first Spiderman broadway issues now The Tempest. Getting Reese Witherspoon, Paul Rudd, Owen Wilson, and Jack Nicholson was already half the budget. Umm not even half a million dollars gross yet... for a $90 million movie that is bad... very bad. Tomatometer: 0% I'm not kidding.